You may feel like you don’t have a head for numbers or strategy but when you’re starting up and running your own business, it’s critical that you have a firm grasp on the finance side of things…After all, you want to be profitable and make revenue, right? The key to a successful business is to know your end goal from the very beginning so you always have a clear vision and plan about what you’re working towards. Where do you want to be in one year, five years, ten years? The one thing you shouldn’t do is wing it as you go along because trying to fix mistakes or backtrack is going to cost you more time and money in the long run. This workshop will be led by our trusty investment partners who are gurus in creating successful business plans and financial planning. They will do a simple and straightforward break down of all those spreadsheets and multi-page plans. Knowing the ins and outs of running your business will not only keep your finger on the pulse but also help you maintain a steady cash flow. A wealth of knowledge for you to plan for a profitable business, financial planning clarity, and a solid business plan structure that you can customize for your own business. BONUS material: All attendees will be provided with templates and guides that are yours to keep and use forever, as well as a complimentary one hour follow up coaching call. * You’ll also have the opportunity to add on a 1:1 financial coaching session where you and a coach can address financial matters in private as you increase your financial acumen. Anna Royall-Smith was voted one of Ahlan’s Hot 100 leading social influencers. After a career in retail with some of the UK’s leading fashion brands and travelling extensively, she became a mother of two and finally laid her roots down in Dubai. She rekindled her love of fashion as one of the creators of Stellar Couture Concierge, a door-to-door evening wear boutique. Through this business, Anna fine-tuned her personal styling skills and is now a sought-after stylist within Dubai’s fashion industry. Don’t you have that one killer outfit that, without fail, makes you feel unstoppable and puts a swagger in your step because you know you look damn good? Now what if you could feel like that every single day? We want you to look and feel your best because when you do, you take on a new level of confidence, which is key for your self-brand. 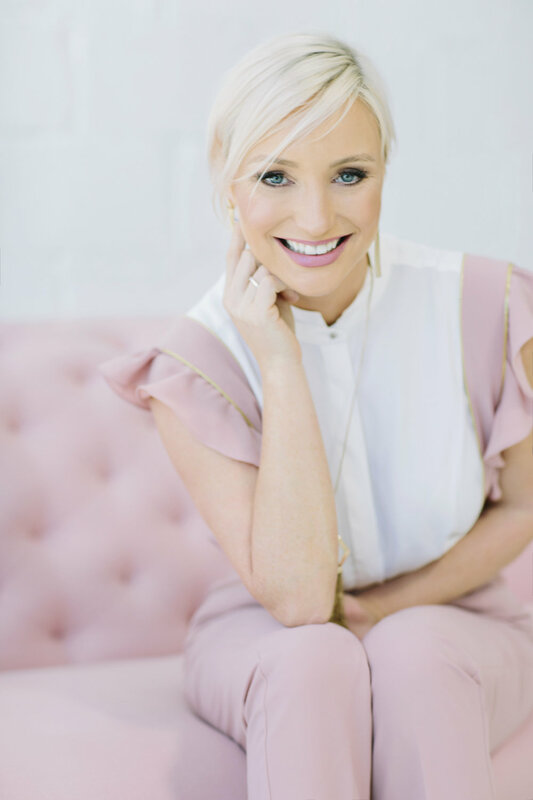 Anna Royall-Smith, an in-demand image consultant and stylist known for dressing celebrities such as Spanish actress and philanthropist Maria Bravo, will help you with everything from how to pose for those PR shoots to having that quiet self-assuredness. Improving your style and image is about making you feel confident and comfortable in any situation thrown at you in the entrepreneur world. On any given day, you might be doing a press interview in the morning, meeting with investors in a boardroom in the afternoon, and networking with potential clients over cocktails in the evening. This workshop will help you find your style and confidence so you can show off your best self and really sell your brand. Are you ready to polish up your image, dress to impress, and finally master successful body language? A revamped or reinvented you that brings out all of your best qualities and has you feeling like a million bucks every day. This is your chance to work with a celeb stylist who will give you personalized style tips, make recommendations for the types of clothing and color that will work best for you, suggest the best hair and makeup for you, and help you (re)discover the best version of you. * For those ReBelles in the UAE who book a consultation, a personal shopping or wardrobe detox are also available. * If you want to make the most of your new look on the day of your session, we can organize photoshoots so you can have a slew of photographs for your website and other professional uses. Is the fear of public speaking standing in the way of your success? If you’re an entrepreneur, it very well could be, which is why it’s about time you overcome this hurdle and own the stage with confidence! Whether you like it or not, as an entrepreneur and the face of your business, you will have to embrace speaking in public. From pitching your business to potential investors to handling press interviews to one day sharing your success story at a TED Talk (let’s think big here! ), you want to feel in control and able to eloquently get your point across. Then get in touch with us and sign up for our next public speaking and presentation workshop! While you may never fully get over your nervousness of public speaking, you can learn how to handle your nerves. One of the best way to overcome a fear is by facing it because it puts you back in control. There are very few people who don’t experience nervous jitters before hitting the stage for a presentation or going out to talk to a crowd. It’s just that those people who look cool, calm, and collected have taken the time to finesse their skills and learn how to deal with their fears of public speaking. Increased confidence for any public speaking engagements you have or are planning to do. A polished public persona with a charming and dynamic edge that will get people to listen to you (because what you have to say is important!). Not only that, but you’ll also have an actionable plan of bite-sized tips that you can put into place as you work towards being more comfortable with public speaking. Setting up a successful branding, marketing, and PR strategy is the difference between becoming a leading authority in your market and becoming a “Who? Never heard of them”. If you want to set yourself up for success, you need to take the time to get to know your brand inside and out, be well-acquainted with the market you’re entering, and know how you’re going to stand out from the rest. While you might have an overall idea of what you want your brand to be, do you know how you’re going to define it and clearly communicate that idea with others? Are you lost when it comes to creating a marketing calendar? What about PR? Who should you be reaching out to or how to make the most out of free publicity? This full day workshop is for those who have a basic understanding of branding and marketing but want to step it up by learning from and working with experts who can provide actionable guidance. You will discover a newfound appreciation for the power of a good brand and how you market and PR it. You’ll have an in-depth understanding and appreciation for branding, marketing, and PR, and how it directly relates to you and your business. If you’re still starting out and budgets are tight, knowing how to do effectively do your own marketing will help you spend smarter and make every penny count. Social media is a must for every brand out there today when it comes to staying relevant and reaching target audiences. Potential customers no longer go to a business’s website first; more often than not, they’ll look at the social media accounts and make a decision from there. Even if you don’t use it personally, you need to at least be familiar with how social media works, the various platforms and which ones you should use, and best practices to ensure that you stay on smooth waters. Sure, you might want to delegate your social media management to someone else on your team or even a third party but before you do that, educate yourself so you know what to ask for and expect. If you want to know the difference between the platforms (like Snapchat, Instagram, Twitter, Facebook) or aren’t sure how to plan out your content, come join us for this social media workshop. This is the perfect intensive intro course that will equip you with all of the knowledge you need to get started, from selecting which platforms to be on and how often you should post, to what times you should post and the tools you should be using to track your analytics. This is an intense crash course on the ins and outs of social media and how to make it work for you. You’ll walk out excited and inspired to get the most out of social media for your brand, with an arsenal of knowledge about the platforms most relevant to you and your audience and how to run your social media without it running your life. You’ll also receive free templates and guides that are yours to keep and use. Now that you’ve gotten your business off the ground and it’s flourishing, it might soon be time to expand your team. Your brand might be your baby but it has to grow up sometime. This is where you might find yourself switching from the owner-operator to CEO. While your business at its core will remain the same, you need to flip your focus so that you’re not just attracting consumers, but potential talent. After all, you can’t expand if you don’t have the manpower to support it. This workshop will focus on how you can smoothly make the transition into being the big boss and how to attract and retain star players who will play an integral role in the growth and success of your business. This intensive workshop will help you understand the different internal approaches you need to take when growing your business, whether in size, location, or both. You’ll walk away knowing the key differences between being the sole owner-operator, the boss, right up to CEO, and the changes you need to implement at each stage. You’ll also know how to build your employer brand and have a clear outline of your recruitment plan. Our experts will talk you through how to make the switch from consumer brand to employer brand and best practices for ensuring that the staff you hire continue to uphold the high standards and expectations you set when you first started the business.